Your first source for medical grade skin care products. SkinMedica® dedicates years of research to formulating advanced skin care products that rejuvenate skin. 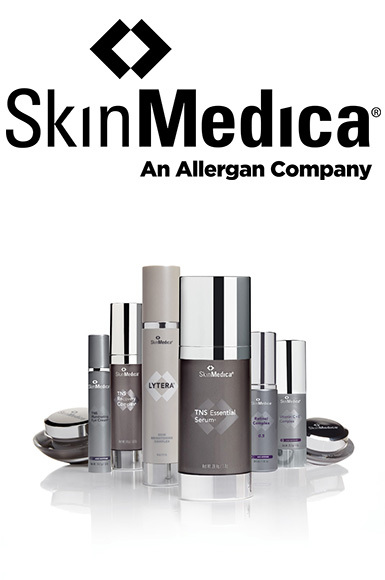 SkinMedica’s entire aesthetic product line is inspired by the science of the skin. As skin ages, elasticity decreases, lines appear and overall appearance is diminished. SkinMedica’s skin care products contain specialty ingredients that improve the overall appearance of skin. Scientifically proven recovery compounds include essential ingredients ranging from vitamins C and E to retinol to TNS® — SkinMedica’s patented blend of growth factors, soluble collagen, antioxidants and matrix proteins. The impact is clear beautiful skin. All results of SkinMedica’s commitment to creating a lifelong skin care solution for healthier looking skin. The Lytera® Skin Brightening System is a hydroquinone-free treatment for unevenly pigmented skin that targets, corrects and helps prevent hyperpigmentation to promote a radiant, more even complexion. Licorice root extract diminishes age spots while advanced peptides decrease excess melanin production deep in your cells. Retinol speeds new, healthy cell growth and vitamin E neutralizes free radicals to prevent further environmental damage. If you’re looking for a more elevated approach to skin brightening, try this simple, yet effective, comprehensive brightening system. This easy to use brightening set is appropriate for all skin types. GREENSPRING MEDICAL AESTHETICS IN TUCSON, ARIZONA NAMED AS PREMIER TOP 50 ALLERGAN (MAKER OF SkinMedica®) PRACTICE FOR US.